So I’ll tell you the story of my first sarcoma patient. I was a brand new first year fellow at Johns Hopkins, where we actually saw a lot of sarcoma patients since Hopkins is a major referral center. Katie Thornton had spent a few months at MD Anderson Cancer Center training under the most experienced sarcoma experts in the country, and had single-handedly started our sarcoma program. She was young, one tough cookie, and fearless, in my eyes. Some of the craziest, sickest patients on the oncology service were sarcoma patients, and were being treated with mysterious, complex regimens. and most of them belonged to her. I was on consults for my first rotation, and I met a 38 year old lady from Jamaica who had been flown in from another hospital in Maryland for Dr. Thornton’s expert care. This lady had an angiosarcoma of the spleen, which had grown so large that it was completely blocking her stomach and intestines. She was unable to eat and was being treated with food-in-a-bag or total parenteral nutrition via an IV. Her pain was so strong she was on a continuous drip of opiates, or patient-controlled analgesia. She couldn’t get out of bed and had been in the previous hospital for over 2 weeks. So Dr. Thornton and I talked about chemotherapy regimens with her, and we treated her with doxorubicin and paclitaxel. After two cycles, about 6 weeks, her tumors had dramatically decreased in size. She was able to eat again and gradually her pain was controllable with oral medications. After another couple of cycles, she was feeling great, and was able to take a month-long trip home to Jamaica where she was teaching exercise classes on the beach and enjoying quality time with her family. We began looking at surgical options to try to remove the tumors and improve her chances at long term survival. Compared to all of the other pancreatic cancer patients I was taking care of at the same time that NEVER got off TPN and were admitted regularly for bowel obstructions and biliary drains, to me this was almost a miracle. Unfortunately, as quickly as the tumor had receded, it came roaring back. Despite several other treatments, we never got control of her disease again, and she died less than 6 months after her initial diagnosis. 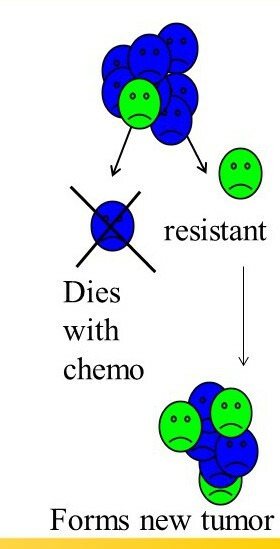 The Cancer Stem Cell concept. This was my first introduction to the cruel paradox of sarcomas. While they often can shrink dramatically with treatment, with Lazarus-type effects similar to treatment of lymphomas and other chemo-sensitive cancers, many times there remains a rogue population of cancer cells that maintain a marked resistance to treatment. Many have dubbed these chemoresistant cells cancer stem cells, as they are thought to not only be resistant but to be particularly adept at sneaking into the circulation and lodging in other organs, where they can repopulate new tumors. My mentor, David Loeb, has published studies in Ewing sarcoma suggesting that this population of stem cells may only be about 1% of the tumor cells – small enough to escape detection by scans that only show the rapidly dying bulk populations. In theory, to cure sarcomas we must develop treatments that are effective against the stem cell population. Cancer stem cells tend not to grow – instead they hibernate, until some unidentified stimulus provokes them to divide again, creating more and more daughter cells that become resistant to therapy. In any case, despite the tragic outcome, I was comforted by the fact that with therapy, we had allowed her to recover enough to return to her normal life, at least for a period of time. Since then, I’ve been encouraged by patients who can achieve disease control for even longer, sometimes years, which suggests that with aggressive treatment and a low enough amount of living residual cells, sometimes the immune system can take over and suppress cancer that remains. For me sarcomas are a mysterious black box with really minimal understanding of what is driving them, and I thought that any impact I would make in the treatment would be even more important. the roller coaster of uncertainty. I found this very interesting and informative to read.